Successfully competing in the crowded online marketplace requires you to take a unique and comprehensive approach to online store marketing. You’ve got to go beyond just using the same old strategies to reach your ideal buyers. If you want to make a real impact in your target market, your brand needs to stand out (in the right ways) and go the extra mile to consistently reach new consumers and engage current customers. Ecommerce Marketing Strategy #1 - Create a Personalized Home Page. The modern consumer has become more tech savvy, and as a result, their expectations for online shopping have increased exponentially. Consumers know the types of technology that online retailers have available to them and these online shoppers have seen it in action. Now, consumers expect sellers to provide personalized recommendations and a curated shopping experience that’s tailored to their individual needs and preferences. One way to create a unique shopping experience (and catch your visitor’s attention right away) is to develop a personalized homepage. Personalizing your website home page with products that match your customer’s interests and shopping behaviors is a great way to deliver a specialized shopping experience. You can track user behavior on your site, and then use the data that you gather to deliver targeted content based on their experience. For instance, you might feature a product on the home page that the buyer has looked at previously. Or you could feature images of similar and complementary products based on the user’s past purchasing history. Showing visitors products that they are most likely to be interested in directly on the home page can help drive more sales. Note that the visitor gets recommended deals right on the home page based on their browsing and purchasing history. Here, Amazon is able to highlight exactly the types of products that the consumer is likely to be interested in. So how do you put this online store marketing strategy to use? First, you’ll want to do a little research on website personalization. It takes a little bit of technical expertise and a lot of creativity to develop a personalize home page or landing page. Then, you’ll want to find a tool that will help you implement these personalized shopping campaigns. There are different types of personalized marketing software that can help you deliver targeted content to the right consumers at the right time. Ecommerce Marketing Strategy #2 - Use Social Proof to Show What Sets Your Business Apart. To put it simply, social proof is a way to influence consumers through the behaviors of their peers or influencers. Online brands can use this phenomenon to their advantage by providing social proof of the value of their products. Consumers want to buy products that will make them feel good about themselves, and providing social proof is one way to help consumers make a purchasing decision and feel confident about the choice they’ve made. When it comes to social proof, a little goes a long way. By showing visitors what others are saying about your products online, you can help them better understand what makes your products worthwhile. One of the best ways to show social proof is by gathering reviews and testimonials from your best customers. Notice that visitors can filter the reviews based on their own concerns, such as “comfort” or “body pain.” This feature allows consumers to see the social proof they need to make a decision quickly and effectively. 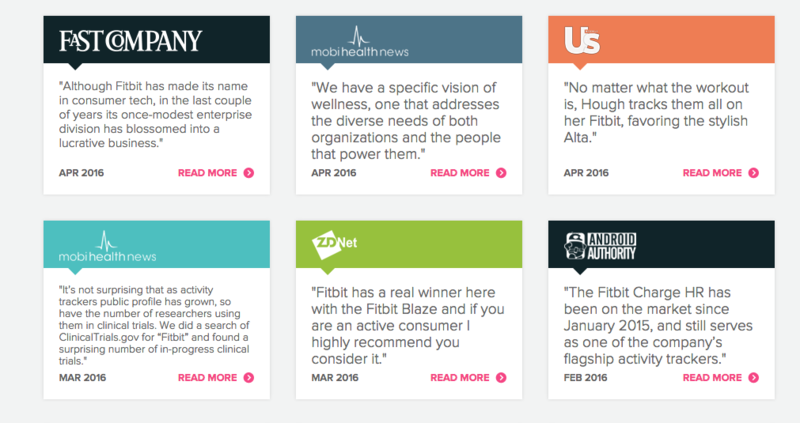 By showcasing sparkling reviews from trusted industry sites, Fitbit is able to build authority among their customer base. Visitors can read for themselves about what makes Fitbit so special straight from industry experts who know a thing or two about smart wearable devices. Providing a mix of expert testimony and customer reviews may be just what your brand needs to influence a sale. Ecommerce Marketing Strategy #3 - Show How Your Customers Are Shopping And Using Products. Reviews and testimonials aren’t the only way to provide social proof. Another way that you can show visitors how popular your products are is by showing in real-time how customers are shopping on your page. This tactic is easy to employ when you use a social proof customer interaction tool on your site. Here, Bizzy Cold Brew is able to highlight interactions that other consumers are having with their business in real time. Any consumer who visits the site will see these notifications pop up while they are browsing the page. These live interactions help build credibility for the business and show visitors how popular the brand and its products are. If you don’t want to include a pop-up that shows visitors who is buying in real time, there are still other ways of introducing this form of social proof to show how popular and dependable your products are. Sometimes a simple counter to show how many consumers have purchased your products is enough to show consumers that there is value in what your brand provides. In addition to showing how your customers are shopping on your website, you can also help visitors see how other consumers are using your products. Showing visitors how consumers use your products can help them better visualize themselves using your products. Social media is a great channel for gathering user generated content that shows your products in action. However, the content doesn’t have to just stay on social sites like Instagram and Facebook. You can highlight these social media images directly on your product page. That way, visitors can see how your products work right as they are making a decision to buy. Not only does the brand often share customer images on their own social media pages, but they bring these photos directly to the product page to show how consumers in real-time how others are using (and loving!) their products. Ecommerce Marketing Strategy #4 - Use Exit Intent Popups for Your Online Store. Growing your brand is about more than just getting consumers to your website. Once consumers are there, you need to find ways to influence conversions before they leave your site. One of the best online store marketing tactics for getting the attention of visitors before they leave your site is the exit intent popup. Exit intent popups are popup messages that appear just before a consumer is about to leave your site. The goal of these targeted messages is to help change the consumer’s mind before they click off your page. You can do this by offering a discount on your products, providing additional content that will help in the purchasing decision, or just getting their email address before they leave so that you can contact them later. This online retailer offers a 10% off coupon while also asking for the visitor’s email address. That way, they are not only providing immediate value for the interaction but they will also have the consumer’s email address to contact them later. This popup also provides the visitor with two options. The “right” option stands out as a black button with white text – “Get my coupon.” While the “wrong” option is hidden below (“No thanks, just let me shop”). Giving the visitor two options, one of which is clearly highlighted helps guide them to the next step in the sales funnel. To get started with your exit intent popup, you’ll want to first find a tool that makes it quick and easy to add the popup to your website. For more tips, we’ve put together a comprehensive guide to designing a high converting exit intent popup to help you get the most out one of the most popular ecommerce marketing strategies. Ecommerce Marketing Strategy #5 - Start a Conversation With a Messaging App. Online store marketing doesn’t have to be a one-way street. In fact, consumers want to have a conversation with you to make sure your brand is right for them. Conversational commerce involves communicating with consumers through messaging apps like Facebook Messenger or a chat bot on their website. And it’s a great way to get consumers more engaged. When it comes to current customers, you can use chat apps to automate customer service, provide specific product recommendations, and send out order confirmations or shipping updates. But when it comes to engaging with leads, you’ll need to get a little more creative. Whether you’re sending consumers surveys that will help them make a more informed purchasing decision or just providing tips on how to get more out of their products, conversational commerce is a great way to get leads and customers engaged with your brand. It also helps you offer the personalization that many other ecommerce marketing strategies just don’t provide. When it comes to online store marketing, if you want better results, you’ve got to try new things. Not every strategy will be effective for every brand. That’s why testing is so important. It allows you to find out what works well for your business and what you still need to work on. Try out some of the ecommerce marketing strategies above to see which tactics best help you reach and engage your target audience online. The more strategic you are with your online store marketing, the faster you will grow with a better return on investment.